Choosing a montreal bagel recipe to decorate your crunchy treat isn’t all that easy. 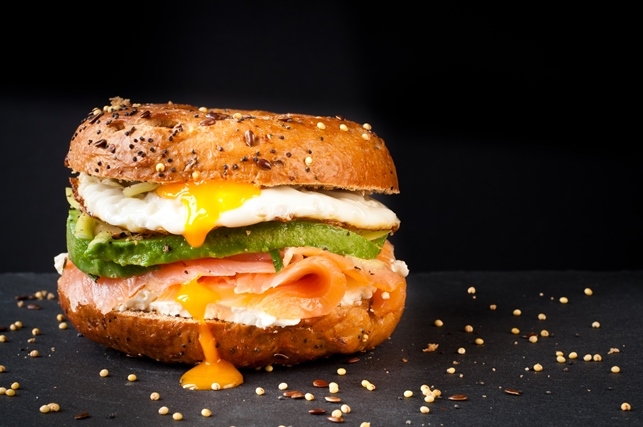 Like us, if you’re serious about your bagel eats, then you’re probably scouring the web looking for the best bagel ideas to craft that perfect blend of tasty toppings. In the spirit of saving you all that time, we’ve gone ahead and compiled a short list of classic favorites to help get that inspiration ball rolling. We’ve picked two well-known recipes with bagels for breakfast, lunch, and dinner, but added our own little flair too. Check them out below, choose your favorite, and start crafting your own unique bagel. All these recipes will work with either oven-baked bagels (NY-style) or wood fired bagels (Montreal-style), though we personally recommend using the latter! --Here’s another unique spin on a very traditional option. Often called the Lox’n Bagel, this smoked salmon variety hits close to its source material, but differs in just a couple key components. Our version calls for cold-water smoked salmon, a heaping spread of cream cheese, grated lemon rind, and a healthy garnish of fresh dill for a tangy explosion. You can even try combining the cream cheese, lemon, and dill into a single smear for a fuller taste experience. --With potentially unlimited customization options, this recipe is perhaps the most versatile on our list. Select your favorite bagel, slice it in half, toast each end, and then smother a layer of pizza sauce across both halves. Dump a handful of mozzarella cheese next, and from there your options are only limited by your creativity. Meat lovers should add some sausage and pepperoni, or veggie fanatics can add peppers, mushrooms, or black olives. --With this entry, we’re throwing it way back to your early childhood. Many of us grew up eating that classic Peanut Butter & Jelly sandwich in the lunchroom, but now, we’ve taken that age-old combination and stuffed it between two crunchy halves of a bagel. Apply the peanut butter first (this is your “cream cheese”) and then add the jelly on top, a tactic that will prevent the bagel bread from becoming soggy. For an extra twist, try add banana slices too! --Who doesn’t love bacon? I know we do, which is why we had to add this entry onto our list. The BLT sandwich has been an instant classic and mainstay in many restaurants for decades, so we know everyone is familiar. It’s easy-to-make recipe calls for cream cheese, lettuce leaves, tomato slices, crispy bacon, and of course your toasty bagel. The saltiness from the bacon mixes well with the creamy cheese for an experience you’ll never forget. --This final entry is perhaps the our most ambitious one, too. This recipe will require a little prep work, mainly cooking the ingredients of the “cheesesteak” before applying them to your bagel. However, the good news is that it’s still very easy to make. Simply cook a few pieces of skirt steak in a skillet over medium heat, and once it’s been heated through, add your cheese, peppers, onions, and any other veggies. Cook for a few more minutes then dump the gooey madness onto your bagel, and you’re ready to go! Bagels are open canvasses perfect to create any combination of food. We hope that these recipe ideas have sparked some inspiration for you, or at the very least reminded you of all the tasty treats you have at your disposal. But, if you’re springing to get started on crafting that perfect bagel, then try ordering from us. You’ll receive a sleeve of your favorite bagels delivered right to your doorstep. Ideal for any Montreal-style bagel recipe, you’ll never have to worry about finding high-quality bagels again. Head over to our product page and check them out today!